Design your own custom backpack flags to display indoors or outdoors. We offer three different flag banner shapes. Choose the style that works best for your business or event. Production time on custom flags is only 1 to 3 business days! Fill out the form to get a design for free in 30 minutes or less, during office hours. if your request is placed after office hours, expect your proof the following business day. Use Feather Flag Nation’s high quality backpack flags to help promote your business at an indoor or outdoor event. 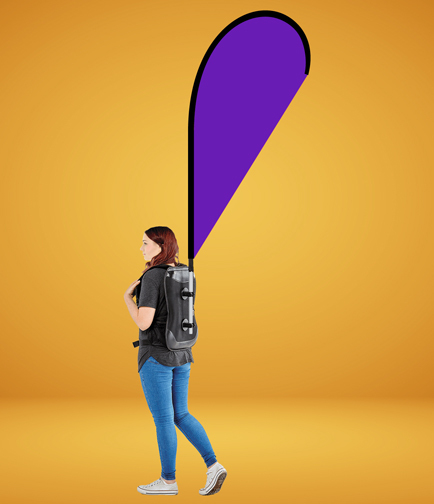 By using a wearable banner, you can attract any audience around your employee with ease. 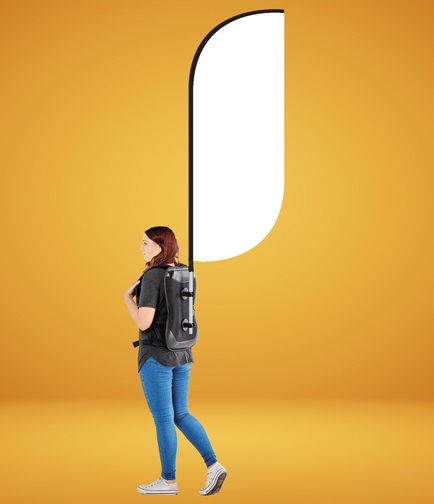 This backpack flag is made for any professional who wants to grab the attention of large audience. Light weight mobile signs are great and effective at shows, malls, shopping centers, busy streets (Las Vegas strip, Los Angeles, Chicago, New York, and etc), trade-shows, and many other locations. What Makes Backpack Flags Great? The answer is simple — MOBILITY. 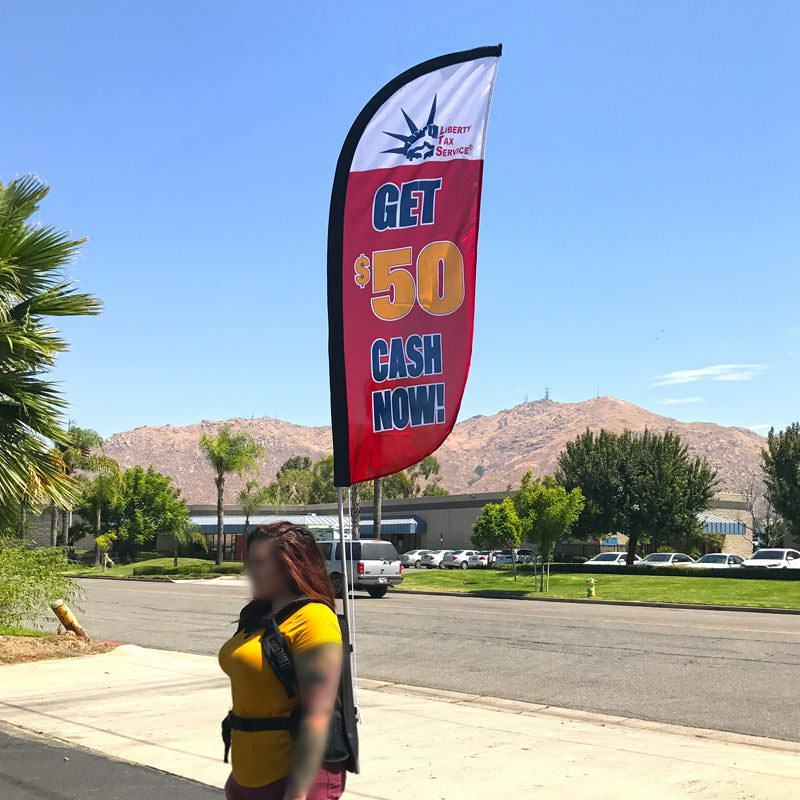 By having the capability of being able to move around with your flag all around a location, you can without a problem display your flag banner near your competitors location, busy intersections, entryways, and a variety of other locations. 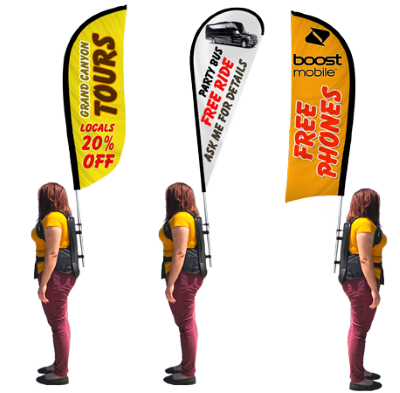 If you see a crowd move to another location, your employee can easily walk with them, keeping your banner displayed. Our backpack flags come with either single-sided or double-sided banner or flag prints. This allows your advertisements to be visible from all angles — regardless of where the wind moves the flag. Each banner display comes with a sturdy backup, a pole kit, and a custom flag with your own graphics. The shapes come in either feather flag, teardrop flag, or convex flag style — choose which is best for your location. Each backpack flag set also comes with a travel bag that can neatly store your banner. Oh, and did we mention that these backpack flags are extremely light weight and easy to setup? Simply telescope the poles, slide and fasten the flag to the pole, and snap the flag pole to the back of the backpack. 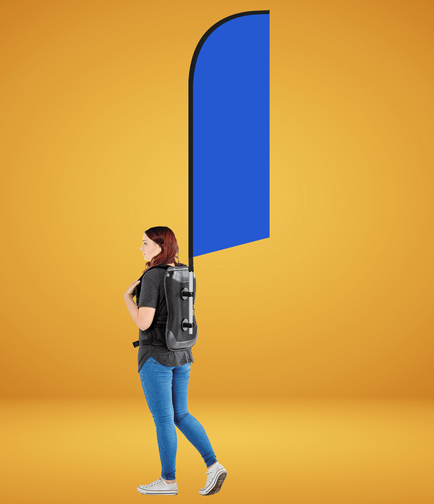 Advertise for your business without breaking your back, literally.